Valentines Day Flowers Delivery Gold Coast. 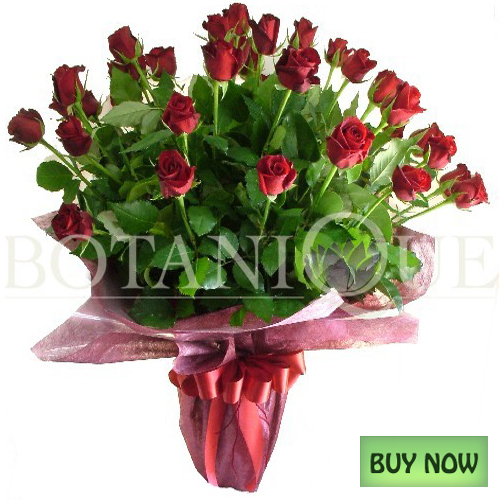 Valentines Day Gold Coast Flower Delivery: Botanique Florists Gold Coast cannot guarantee time specific delivery on Valentines Day without a 'Rush or Urgent' delivery fee (see below). Also provide a contact telephone number and home address for a business delivery addresses. All flowers delivered on Valentines Day will be delivered in either our silk lined 'Hollywood Box' with crystal buckle accent (see Hollywood Roses) OR our standard silk lined clear box (see Emmi). This is to ensure that your flowers arrive in the best condition and without damages or losses to any gifts accompanying your flowers. In the event that you order an arrangement that is not from our 'Valentines Day Flowers' section, we will do our best to arrange your chosen flowers into our beautiful hollywood boxes. Order BEFORE 5PM 13th Feb: Arundel, Boykambil, Coomera, Gaven, Helensvale, Hope Island, Maudsland, Monterey Keys, Oxenford, Oyster Cove, Pacific Pines, Park Lake, River Downs, Sanctuary Cove, Santa Barbara, Studio Village, The Shores, Upper Coomera, WESTFIELD Helensvale. Allamanda hospital, Andrews, Ashmore, Benowa, Biggera Waters, Broadbeach, Bundall, Burleigh Town, Burleigh Heads, Burleigh Waters, Carrara, Chevron Island, Chirn Park, Clear Island Waters, Coombabah, Ernest, Ephraim Island, Florida Gardens, Gold Coast hospital, Gold Coast University Hospital, Harbour Town Shopping Centre, Hollywell, Isle of Capri, Labrador, Main Beach, Mermaid Beach, Mermaid Waters, Merrimac, Miami, Molendinar, Mudgeeraba, Musgrave Hill, Nerang, Nobby Beach, Pacific Private hospital, Paradise Island, Paradise Point, Parkwood, Pindarra hospital, Robina, Robina hospital, Runaway Bay, Sovereign Islands, Sorrento, Southport, Southport hospital, Stephens, Surfers Paradise, Varsity, Varsity Lakes, Varsity Waters. Extra delivery fees may apply to these areas, please choose the relevant postcode in the checkout or request a quote below or telephone +61-0-755737666. Order flowers BEFORE 2PM on the 13th Feb: Advance Town, Banora Point, Beenleigh, Bilambil Hts, Bilinga, Bonogin, Coolangatta, Coomera Waters, Currumbin, Currumbin Valley, Currumbin Waters, Eagleby, Eagle Heights, Elanora, Gilston, Gilberton, Guanaba, Jacobs Well, Kingsholme, Kirra, Maudsland, Mt Nathan, Mt Tamborine, North Tamborine, Ormeau, Pimpama, Reedy Creek, Tallai, Tallebudgera, Tugun, Tweed Heads, Willowvale, Worongary, Wongawallan, Yatala. All Valentines Day Deliveries, will be delivered any time between 7.00AM and 7.00PM on Valentines Day 14th February. While all reqests for time specific and AM/PM deliveries will be considered we cannot guarantee this due to the large volumes of orders during this peak time. For a specific time delivery on Valentines Day you will need to choose "Express/Specific Time Delivery" at the checkout. This delivery gaurantees for a delivery within a 4 hour delivery window. Valentines day guaranteed time specific delivery (express delivery) will be calculated at $34.95 each address. Use this delivery option for any deliveries to business addresses with specific working hours or time rules. When choosing this delivery option please leave preferred time frame of delivery in 'Comments' section at the checkout (eg. please deliver between 7am and 1pm) otherwise your order may not be delivered on time as we cannot read minds. This rule does not apply for funeral deliveries. All designs illustrated are a guide to the style of flowers, gourmet foods and gifts that will be delivered. Occasionally they may vary according to regional or seasonal availability, or when they do not meet Botanique Florist Gold Coast quality standards. In some cases, substitutes of a similar value may be necessary to meet your requirements. Some flowers may be delivered 'in bud' to provide longer enjoyment. You and your recipient must be 18 years or older to order or receive alcoholic beverages. Cancellations or alterations to orders must be made within 24 hours of ordering or prior to delivery, whichever is the shortest time. In the event your order is not what you expected, please return the unsatisfactory item to our studio at 103/3 Sir John Overall Drive, Helensvale, Queensland Australia, within 24hrs and we will provide you with a 'no questions asked' full replacement. For interstate and international orders, please contact us within 24hrs and we will follow up the complaint with the sending florist. 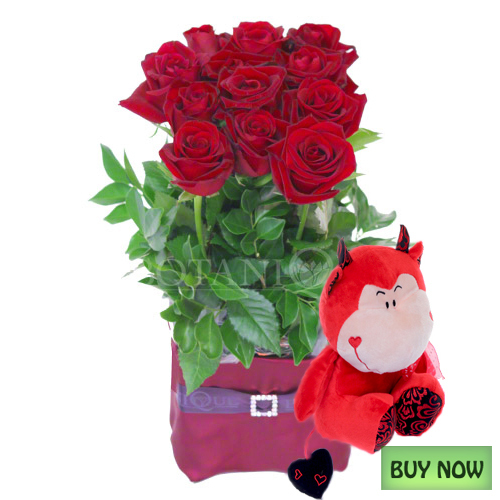 Order Valentines flowers online with confidence this is an SSL secure web site.